Is a Maltese Schnauzer Mix the Right Dog for You? They are an intelligent, perky Maltese mix that is growing in popularity because of their loving and energetic personality. Read more about the Mauzer below to see if this is the right Maltese mix for you. 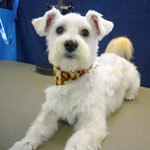 Do you have a Maltese Schnauzer mix? Tell us more about his/her personality & your dog could be famous! These dogs take on the temperament of both Schnauzers and Maltese. They are playful and affectionate little dogs. Most are very alert and obedient; which makes them easy to train. 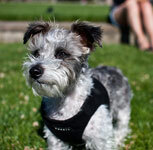 The Miniature Schnauzer Maltese mix tends to be an excellent watchdog and can be very vocal when happy or excited. These dogs are great with children and other dogs, but will sometimes chase smaller animals such as cats. Most people find Maltese Miniature Schnauzer puppies to have a spirited and friendly personality. If you already have a Maltese x Schnauzer or know someone that does, check out these unique gifts for dog lovers below. This Maltese mix is usually black, white, silver or a combination of these three colors. Hair is usually short and wiry. Maltese Schnauzer dogs should be brushed daily and be professionally groomed every 6-8 weeks to keep hair trimmed, clean, and free of mats. They shed little or no hair and most are hypoallergenic. Full grown Schnauzer Maltese mixes can weigh anywhere from 8-15lbs. Do you have a Mauzer? If so, your Maltese mix could be famous! Please tell us all about your dog and we'll put it on our website. What kind of personality does s(he) have? What makes him/her so special? Let other Maltese Maniacs know what to expect from a Mauzer. Submissions must include at least 200 words of text and a picture to be accepted. Thanks! My Mauzer dos is sweet, playful, and determined. What would I do without her? I think Maltese Schnauzer dogs are the best!